June 1st, from noon to 4pm, will be the first annual celebration of Bainbridge Island road ends. In this podcast, we meet two veterans of the island’s back roads and byways. Bitsy Ostenson has served on the City’s Road Ends citizens committee for 22 years — mostly as its chair. Dana Berg is a founder of “GO! Bainbridge”, a project of Sustainable Bainbridge that encourages walking and biking as a healthful and exhilarating alternative to car travel. 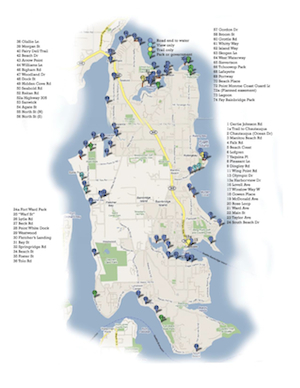 Click on this map of Bainbridge Island road ends to expand it to full size. In this 5-minute event preview interview with BCB’s Barry Peters, Bitsy and Dana also describe the history and significance of the island’s scores of road ends. The June 1st event begins with a check-in at Waterfront Park, where you will receive a map highlighting 7 road ends in the Winslow area. This year, the road end event and map will feature sites on Eagle Harbor. The first site is at Hawley Cove, east of the ferry pier and half way to Wing Point. The seventh road end on the map is at Gowen Place, on the inner reaches of Eagle Harbor on the north shore. For this June 1st event, cycling and walking are encouraged. Volunteers will staff the seven road end locations. Credits: BCB Host and Audio Editor: Barry Peters. Ferry/music intro: Dogfish Bay Studios. Synthetic music splash: Dave Bristow.